I got so used to eating the darn things that I needed to figure out a way to make them on my own at home. After doing a bit of research, I found that a famous chef and a well-respected website had already covered the topic in great detail. Traditionally, multiple cuts of pork are skewered together and slow-cooked, and finally charred on the rotisserie. In order to get that same texture and feel, I went back and forth to find the right cut of pork to put on a skewer, finally settling on pork tenderloin. Though it’s the most expensive of all pork cuts, it really takes well to the marinade and results in a tender, flavorful meat. Sliced and stuffed into a warmed pita and topped with homemade tzatziki and other accoutrements, I promise you will soon feel painfully full in the best way possible. Combine all ingredients (except the skewers, of course) into a ziplock bag, seal, and marinate in refrigerator overnight. Preheat grill to medium-high heat. Meanwhile, skewer pork pieces together. Be sure not to overcrowd the skewers, as the meat will steam instead of char. You want to give a bit of space between each cut to ensure it takes on the maximum flavor during the grilling process. Place skewers on grill and cook for 4 minutes per side. Remove from grill and tent with foil for 10 minutes to rest. Remove meat from skewers and slice as thin as possible for assembly. 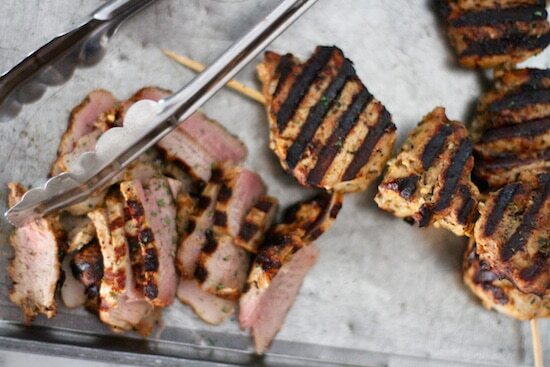 The acidity from the yogurt and lemon juice really help to make a tender cut like pork tenderloin even more perfect. With the addition of some herbs and the overnight marinade, this meat will take on all the traditional flavors that you’ve come to love from a traditional gyro. 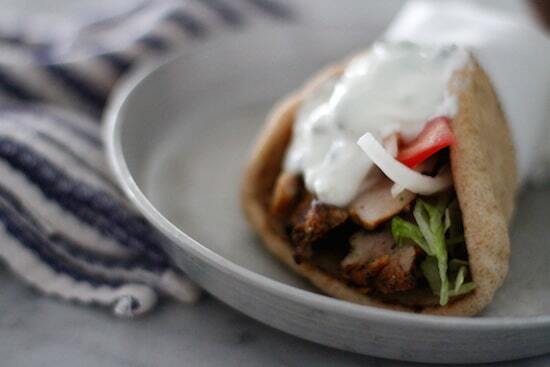 A gyro ain’t a gyro without a great tzatziki. This yogurt sauce is infused with plenty of garlic and cucumber and is not only absolutely addictive, but healthy to boot. Try it as a dip for vegetables, on a baked potato, or basically any cut of grilled protein. I’ve simplified my version to the very basics, but you can always amp up the flavor of this sauce with fresh chopped mint should you choose.